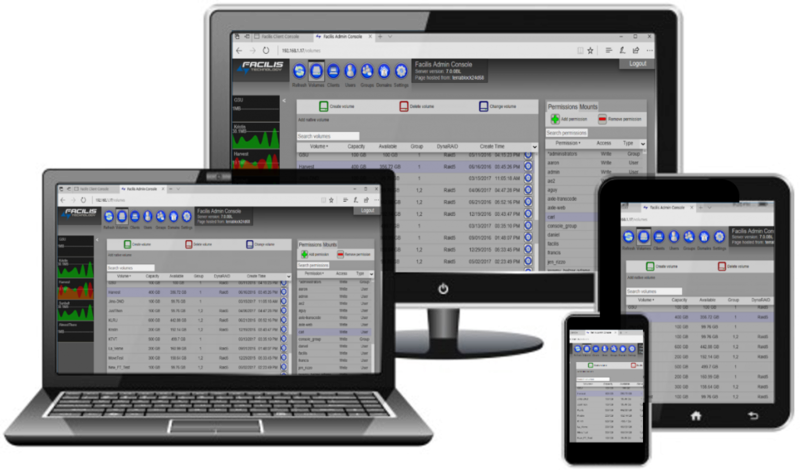 The Facilis Web Console gives you total control over your shared storage environment. 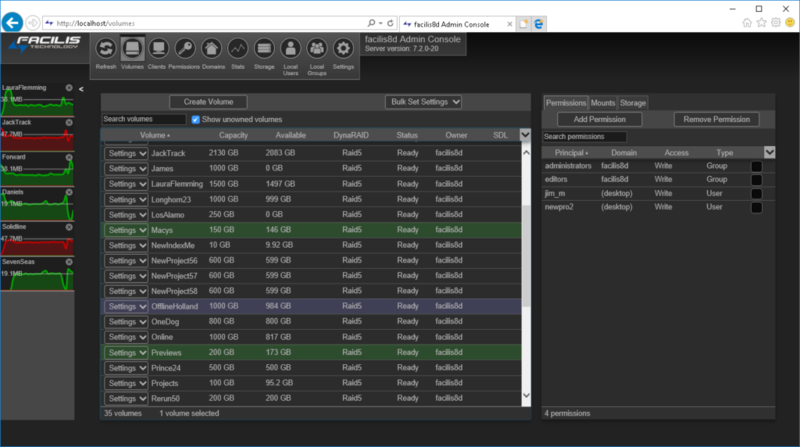 Create, change and permission project-based storage volumes, and deploy them to the desktops of the facility workstations with the push of a button. 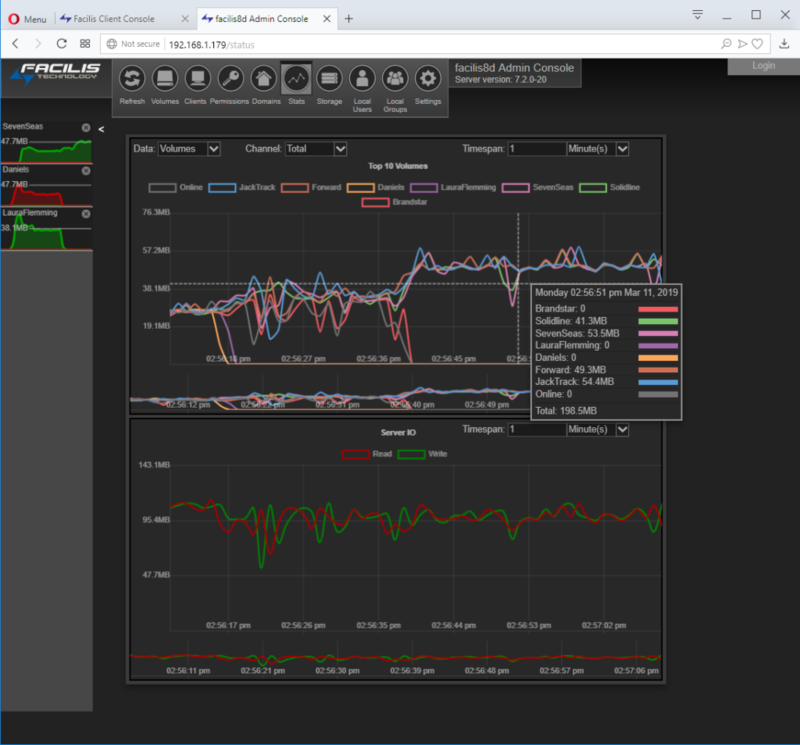 Monitor real-time bandwidth usage by workstation and volume and apply the optimal server and client connections dynamically. Log in securely to manage the workgroup from any browser, on any device that can access the server IP address. Set up user and group look-up with your active directory server for a single point of user account administration, or apply permissions based on desktop user account and/or secure user/password. This is just one of the many features that come with our video storage servers. Start the purchasing process today! Access all administrative functions as well as client-side access control using standard browsers on any OS or mobile device using touch-screen enabled features. When the server is available over multiple paths, the client profile software will enable a secondary path to the storage if the first is interrupted, without any manual configuration or user intervention. From any browser interface, the administrator can manage volumes on the desktops of the client workstations, adding or removing volumes as needed. When multiple connections to the server are available, the administrator can determine preferred network path on a per volume or per workstation basis. This can be used to increase or throttle access to certain volumes. Even when connected through Ethernet, mount volumes as Local Multi-user Write, appearing as a hard drive icon in Finder or Explorer. Network drive restrictions are removed, and OS-level access speed improves. In multi-server environments with Fibre Channel interconnect, volume ownership can be assigned to other servers to help with load balance, or as a failover operation in RAID51 and Hub server environments. Explore current and past performance of your storage on a per-volume, per-user and system-wide basis with weeks of historical data at your fingertips. Help the team determine overall load and where changes can be made. User and group accounts through AD/LDAP directory services can be used to permission Facilis virtual volumes, through OS login or password protected console access. Remove the task of manual install per-client during upgrades with remote software deployment. Select any clients and upgrade software with a push of a button. Per-volume selectability for persistent mount to logged-on workstations. Add security by disabling persistence or add ease of use with immediate access on boot.